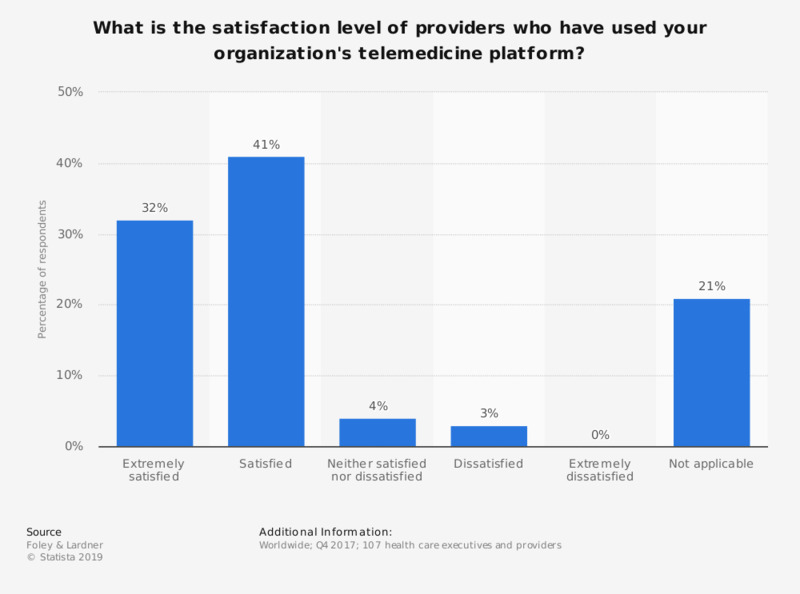 What is the satisfaction level of providers who have used your organization's telemedicine platform? This statistic show the percentage of telemedicine providers that have clinical customers with select satisfaction levels with their programs as of 2017. According to the data, 41 percent of telemedicine providers are satisfied with the platforms they are using. The survey included responses from senior-level executives and health care providers at hospitals, specialty clinics, ancillary services and related organizations. What is the current status of your telemedicine program? Does your organization offer telemedicine services internationally? Which of the following has been a challenge to implementing telemedicine practices in your organization? Do you think that telemedicine services should be implemented? In which, if any, of the following circumstances would you be willing to use a video consultation with your GP?